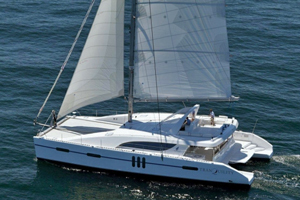 Brand new Matrix Yachts catamaran Tranquility is indeed rare. 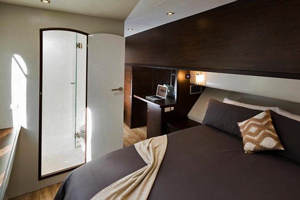 She accommodates 12 guests in 6 cabins a master suite convertible to twins, 3 queen cabins and 2 twin cabins all with en-suite WC/shower rooms. 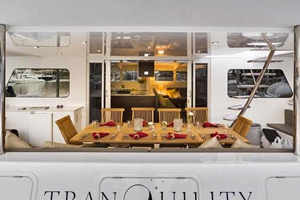 Tranquility’s wast 38′ beam allows for a spacious gourmet bistro galley with bar, al fresco dining on the aft deck for 12 and flybridge seating for 20. Tranquility’s chef will serve you 5-star all-inclusive culinary sensations together with exquisite wines chosen but worlds top sommeliers and a Caribbean cigar selection. 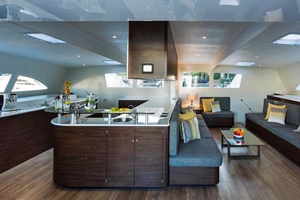 The catamaran’s features a huge aft platform between the hulls that will raise and lower the dinghy, but can also do the same for 10 divers, or allow a group to relax in deck chairs while you sip a cocktail with your feet cooling in 6 “ of water – it brings the beach to Tranquility! It’s similar to a “resort shelf” on a pool. 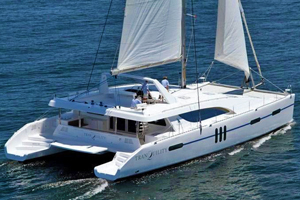 Look no further, take advantage and book this very special catamaran by contacting us at Nicholson Yacht Charter & Services, we’ll be delighted to give you further information on the yacht the crew and availability.